After one of the most incredible night in Irish football history, do you think Trap can take advantage? 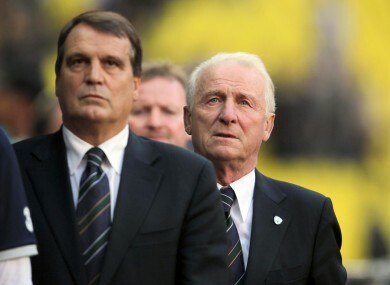 Marco Tardelli and Giovanni Trapattoni. SO HOW ARE we all feeling this morning? Last night, may be one of the most memorable in Irish football history. First, Ireland somehow earned the unlikeliest of points despite a 90-minute Russian onslaught. Later, incredibly, Armenia hammered Slovakia 4-0 in Zilina, throwing open the group again. Russia are now top with 17 points, Ireland are two behind in second while the Armenians and Slovakia are on a total of 14. Giovanni Trapattoni’s now prepare for an away tie in Andorra and a final game showdown with those dark horse Armenians in Dublin. Email “Poll: will Ireland now qualify for Euro 2012?”. Feedback on “Poll: will Ireland now qualify for Euro 2012?”.